One of the recurring questions about the Altra Instinct is "just how wide IS the toe box?" I'll attempt to answer that question, and make some direct comparisons between the Instinct and the Trail Glove. First, my Altra Instincts are a size 10.5, while the Merrell Trail Gloves are a 1o. I consider them to fit equally well on my feet, which aren't considered wide, but feel wide inside shoes (I like to have forefoot room, for whatever reason). 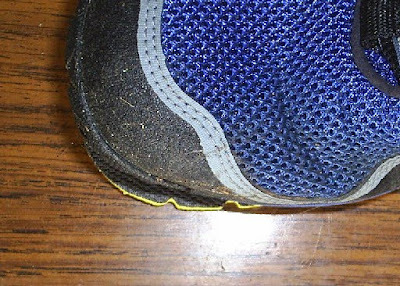 Today it was asked on the Born to Run forum if some one could just take the insole out of an Instinct and lay it on a measuring tape. So here it is -- it measures out to almost exactly 4" in width at what would be about the widest part of the metatarsals. 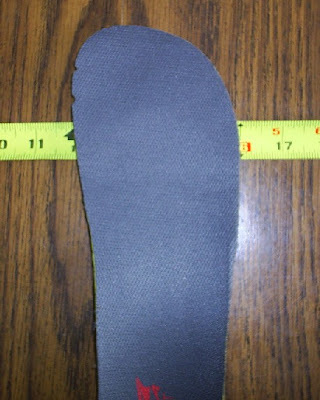 This is the "Support" insole, which is the same width as the "Strengthen" insole, just with more contour at the heel and arch. Also, I set the Trail Glove onto the Instinct insole to compare the shapes and sizes directly. You can see that the Instinct insole is slightly narrower than the Trail Glove, which might partially be due to comparing the inside of the Instinct to the outside of the Trail Glove. Interestingly enough, when on my feet, the Instinct feels every bit as roomy as the Trail Glove. One of the reasons for this, I believe, is because of a small difference at the big toe. You can see in the third picture this slight difference -- the Trail Glove curves inward slightly from the ball of the foot, where the Instinct continues to widen. I think this aspect of the Instinct allows for a little more toe splay, which makes the Instinct FUNCTIONALLY wider than the Trail Glove. In the end, though, these shoes are meant to address different needs -- the Trail Glove is a trail shoe, and it shines in that environment. The Instinct is more of a road shoe, with good cushion (not squishy like the Kinvara at all). I've run with the Instincts on trails, and they perform quite well. Around here (Cascade foothills), "trails" mostly means soft dirt. I just prefer the Trails Gloves in that environment. I've done all of my longest runs in the Instincts, because they've involved mostly roads. With my trail race on Saturday, I'll be wearing the Trail Gloves. Unless something else comes up that absolutely blows my socks off, though, I'll be wearing the Instincts for my coming half marathons. In my last poll, I asked about what bike aspect was most mysterious. Of the six votes cast, two were under "fit". Now this is a big subject, and depends on the type of fit sought. I'm not trying to take the place of a professional fitting, and I'm not an expert on Fit Kit or other fitting methods. I'll be talking about generalities and goals of bike fit. The main difference between a road fit and a tri fit is the emphasis on aerodynamics. In essence, the positions are pretty similar -- the tri fit is just a road fit that's been rotated forward about the bottom bracket. But the positions are built from opposite ends. Road bike fits are made from back to front, and tri fits are made from front to back. Firstly, a road bike is built to be stable at speed. "At speed" will generally mean anything north of about 10 mph. There are a lot pieces of the bike's geometry that go into that stability, but the end result is that the bike wants to keep going in a straight line, unless you do something to it. Part of the design of the bike is the distribution of the rider's weight between the two wheels. They're designed to be best with about 45% of the rider and bike combined weight on the front wheel. This is why, when triathlon was in its infancy, and we were all using various methods to "get low and forward" on our bikes, they got all kinds of twitchy, getting a mind of their own. Too much weight was going onto the front wheel on a bike that wasn't designed for it. But aside from the bike's stability, there is also the comfort of the rider. I'll ignore the fact that, for a new rider, a bike saddle is NOT going to be comfortable. There are some things to which we just have to get acclimated. But one of the big things that new riders struggle with is the hands. Numbness, tingling, tired arms. This is NOT something to which one just gets acclimated! In fact, if you try to put up with this for too long, things like carpal tunnel syndrome can result. The goal of a road fit is first to get the balance at the back so there isn't so much weight on the hands. How is this accomplished? By sitting back far enough, and having the core strength to hold your upper body. Something that helps with this is the amount of force generated by the legs on the primary power phase (pushing down on the pedals), as this gives part of the moment (one of those physics/engineering terms that just means a force that tends to rotate something around an axis) that holds the body up. But most new riders won't have the specific strength to produce this force in abundance for very long. It takes time to build up. Don't worry, it'll come. So back to the idea of having your weight back... Think of squatting down into a sitting position. The farther you lean forward, the more of a tendency there is to fall forward. Same thing on the bike. The saddle should be back far enough that the weight on the hands is minimized. You should almost be able to take the hands off the handlebars and not fall forward. As experience and bike-specific strength develops, the position can come forward if desired. Also, sometimes physical weight distribution of the rider will change over time... Periodic re-evaluations aren't such a bad thing. Once this point is established, then comes body lean. This is determined by two things -- comfort and flexibility. Aerodynamically, you want to lean forward as far as you can. But with the weight pushed back, you're likely not going to get your back level with the ground. Kudos to you if you've got the gluteal flexibility to make that happen, and hopefully your neck will be able to handle the hyperextension... Anyway, you want to make sure you're not going to the limits of your range of motion, but also it's surprising just how close you can get when you're not dealing with eccentric muscle contractions. The forward body lean can affect that forward/aft weight distribution, so sometimes adjustments need to be made there to accommodate. This is a little bit of an iterative process. Next comes the location of the handlebars. I'll leave width alone, as that is mostly just a matter of what the rider likes (I've got everything from 36 cm on my track bike to 44 cm on my commuter). But you want the bars where they can easily be reached in all hand positions (tops, hoods, hooks, drops), and not over extend the elbows or rotate the shoulders too far out. The hands should be able to rest in a relaxed manner on the hoods, with a slight bend at the elbows. Going to the bar drops, there is more body lean involved, but not so much that the legs have to splay outward to avoid hitting the stomach (whatever size it happens to be). The best approach is to get all this done BEFORE you get the bike, not only so you know what size bike you need, but which bikes will fit. Some bikes are made with very slack seat tube angles, which will more easily accommodate a rearwards seat position if needed, and not have so long of a top tube that you can get the handlebars in the correct location for you. We just went through this with my wife, and she started with a professional fitting done at Sammamish Valley Cycle. From there, we could narrow down the field to those bikes which would fit her. That's not to say that whatever bike you have can't be adjusted to fit -- seatposts and stems are some of the least expensive bike components out there (as long as you're not emotionally attached to carbon fiber). * How you do anything, is how you do everything. * Strain is effort burdened by emotion. The first one is kind of a general guiding phrase on how you apply yourself in whatever you're doing, and how the weakest link in your chain is really what defines your game. The second, though, has fueled a lot of how I approach racing, and even intense training. We all know what strain does in racing. Doesn't matter the distance, strain is detrimental. We've all seen it -- the person starts fast, smooth, then some one comes up on their shoulder, presses, and when it comes down to the final sprint, the person who wins is the one who maintains calm, maintains their form, maintains their emotional distance. The key is to make every effort count. Effort only goes into those actions which promote the needed movement, everything else is relaxed. Watch the front-runners at the elite marathons. There's a reason their speed looks so effortless -- all the effort goes directly toward making the needed motions, and nothing goes into unneeded motion. Faces are slack, hands and arms relaxed. Emotion clouds this direction of energy and diverts it toward expression, aggression. Some people will claim that it was that aggression, that surge of energy from emotion, that saved their race at some point. I can't argue that -- I wasn't there. But I would submit that, if they practiced avoiding the emotion in the first place, if they'd trained themself to avoid the strain, the same could have been accomplished, and maybe more, with less effort. Become the zen master. Don't strain. Let your performance flow. And put a lot of effort into making it look effortless. So my wife and I timed a 5K in Seattle on Saturday morning. A small race, maybe 85 participants. Afterwards, we toured the local Road Runner Sports, Gregg’s Greenlake Cycles, Title 9 Sports, Super Jock ‘n Jill, then drove over to Bellevue to check out the Born to Run store, the only “local” carrier of the Altra line. I’d emailed the store to check on availability, and got a response on Thursday that the shoes had just arrived. The store itself is pretty small, and they had Jason Robillard’s barefoot running video’s playing in the background. Anyway, I asked to try on a pair of the Instincts in size 10.5… Out came the box. I slipped them on, and had the same “ahhhh…” reaction as when I first tried on the Merrell Trail Glove – just so much toe room, that feeling of freedom. I jogged around the store a bit, and something just was a little off. I tried swapping the insole from the contoured to the flat in the right shoe, and tried it again. As has been reported by another blogger (though at this point I don’t remember who that was – sorry! ), that actually felt a lot better. It wasn’t until today that I took them out on their first run. Oh, yeah, remember those “not so smart” things? Yeah, well, I wanted to do a long run today. In fact, longer than I did over a week ago, which was my to-date longest run in over 12 years. In new shoes. “That’s just not done,” I could hear the old-timers saying. It’s the sort of behavior that has disaster written all over it. Well, not only did I do fine in my first long run in zero-drop shoes, and my first run in the Altra Instinct, but I bettered my pace from the previous long run by 7 seconds per mile, and stopped less in the process (only twice to adjust shoe lace tension – expected in new shoes). I felt my form just staying tight the whole way, and didn’t have to keep reminding myself to pull the stride in, stay loose, and keep the cadence up. My calves definitely felt the difference of zero-drop, but the shoes themselves seemed to promote the relaxation that kept everything a-okay. Foot-wise, there wasn’t so much as a hot spot to suggest that a blister was on the way in later miles. My impression of the shoe is that it is what the Merrell Trail Glove would be, if it were built as a road shoe. And I consider that high praise. It’s EXACLTY what I was looking for. With tonight’s run at over 10 miles, I think I now have the confidence that the race distance for Soaring Eagle on the 30th won’t be an issue. Picking which shoe I want to wear? That could be a problem. I’m still leaning toward the Trail Glove, just because of the nature of the trails. But if I had a road half-marathon tomorrow (which, thankfully, I don’t), no question I’d slip on the Altra Instincts. In an ongoing theme, I've become reacquainted with something I used to do a lot of, but had kind of forgotten over the years of leaving endurance sports for a while and then re-entering that world. Mental training. Imagery. We've all heard about the study where basketball players were divided into two groups -- one practiced free throws, the other only mentally practiced free throws -- the surprising result being that the group that only did mental practice improved more than the group that actually handled the ball. I remember hearing about that study in psychology class (didn't everyone who went to college take Psych 101? ), and I decided to practice mental imagery in my own training regimen. But basketball is a skill sport, tri isn't... Uh, right. There's a whole lot more to the mental side of tri and running than one would think, and if you're making a transition to bareform running, there's a whole lot of skill involved that isn't going to be automatic for quite a while. A lot of my mental training was in the late evening, when I was laying in bed drifting off to sleep. I'd picture in my mind the perfect swim stroke, the perfect pedaling circle, the perfect run stride, feeling effortless in speed, relaxing everything that wasn't involved directly in making that speed. But the key isn't just imagining what it looks like, but how it feels, sounds, from inside. That smooth stride, where vision isn't bouncing at all, how everything feels like it's floating, barely touching the ground. Fluidity. What is it that brought this to mind? Well, on my run yesterday in the Trail Gloves, where we had what seemed like the total gamut of weather (and where I looked skyward and said "Is THIS the best you've got? "), I was on pavement, and everything just hit right. Light foot contact, smooth stride, effortless propulsion, breathing easy... And I thought "this is what I'm supposed to be doing ALL the time." So I'm going to be retreating into my mind (and hopefully not getting lost) more often, visiting that place where performance is perfect. I remembered the way to get there more often, and eventually all the time. There's been a bit of buzz surrounding the press releases coming out of the Brooks company, with their pending market introduction of the PureProject shoe line this fall. Much has been said on the Barefoot Running University site, Runblogger, and the Born to Run forum... While I can't argue with the fact that there are some definite contradictions, and some specious science behind the ad hype, I think a couple things are getting ignored. If what I've seen so far is any indication, Brooks is set to release some decent "more minimal" shoes. Yes, it would seem they're copying the 4mm heel drop that New Balance has used to great effect (and Saucony, if you ignore the insole). And it may seem like a "me too" effort to cash in on a growing trend. But really, there aren't that many offerings in that category, so they're catching the wave early. The fact that Brooks used a marketing research company to investigate the possible shoe direction, and that it was concentrated on new runners may seem ill-advised to the scientific types out there, but really, it's kinda smart on their part. I don't think that designing a "more minimal" shoe is all that difficult. Heck, if an engineering hack like me can come up with a list of specs, when all the experience in the industry I have is wearing a whole lot of shoes over the last 30 years, then I don't think it's something that challenges people who live and breathe this stuff every day. How should the shoes LOOK? Hey, style ain't my strong suit -- just ask my wife. That's where asking around comes into play. But why new runners? Well, for one, they couldn't ask existing Brooks customers. What's been the best-selling Brooks shoe? The Beast? These people wouldn't give a "more minimal" shoe a second glance. Ask the barefoot running community? The first thing read in most reviews of minimal shoes from these folks is just how much ground feel is lost to 1mm of cushioning. But new runners? These are the people who are likely to become customers of this new line. Their specs page has a graphic to depict what the shape that the shoes will be, and when I look at it, I'm a bit horrified -- doesn't look anything close to MY feet, nor any one else I've seen. And it's clear they're still designed for heel striking. That huge heel... Not in height, but in width. We'll see. It shouldn't get in the way of a forefoot or midfoot landing. Anyway, for me, though Jason Robillard wants us to look at the ethical intent of the company when we look at shoes, I gotta go with what works and fits. I was really excited about the new Balance Minimus Road... until I tried it on. The last shape just wasn't right for my foot. I'll take a "wait and see" approach with the Brooks line. So I'll wait, try them on, and if they fit well, likely I'll buy some. CEO's are human, and it doesn't mean that every one in the company thinks the same thing (heck, I often don't agree with my direct supervisors, let alone the top dog of the company I work for). But still, as the man-in-the-trenches, I do the right thing. I think there are some people in Brooks that are the same way. So let the double speak happen, but try on the shoes and let your feet vote.